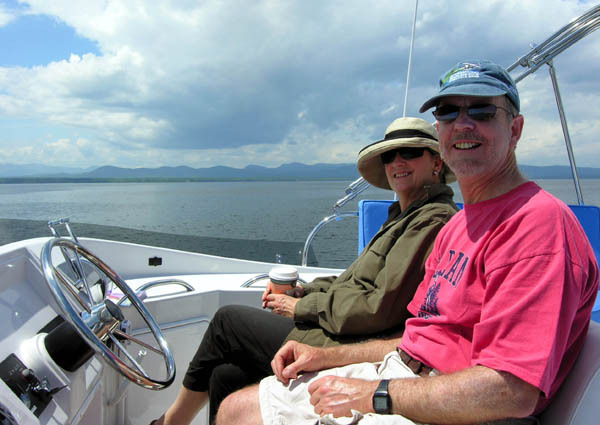 After ten days at a mooring in Burlington, VT, we continued our journey southward on Lake Champlain toward our nominal home-port of Portsmouth, NH. 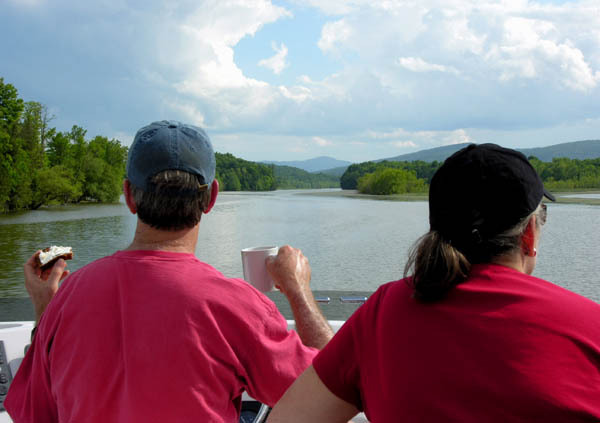 By car it's a 3-hour drive, but by boat it is over a 500-mile trip. Joining us for (at least part of) this segment of the cruise were my brother Kit and his wife Noele. Cruising on Lake Champlain, Noele (Starbucks in hand) and brother Kit. "Otto" the autopilot at the helm! Now, it's Kit's turn to drink coffee! With the autopilot engaged, not much actual helmsmanship is required. Here, we are entering the southern portion of Lake Champlain which narrows to river size - the scenery continues to be wild and beautiful. The southernmost point on the lake is Whitehall, NY where we entered the first lock of the Champlain Canal. 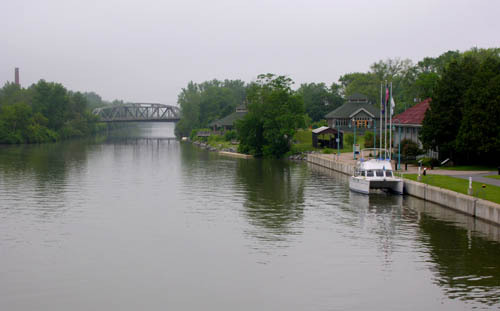 Free dockage in Whitehall, NY - birthplace of the American Navy! Unlikely - by true! At right, the beginning (or end) of the Champlain Canal in Whitehall, NY. The bridge ahead was the lowest of the trip -, we had to lower our mast to pass under, but we managed to just squeeze under with the Bimini still up - clearance was a bit less than 16 feet. A view of Whitehall from Skene Manor located on a hill across the canal. Sno' Dog on the wall. 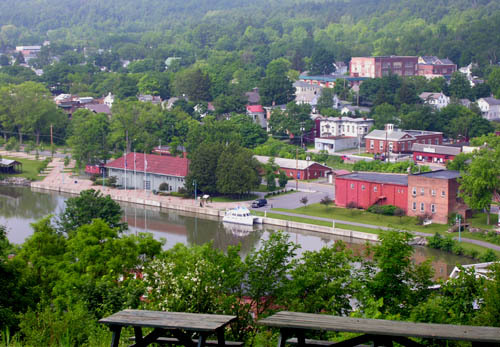 A few locks down the Champlain Canal brings you to Fort Edward, here the canal joins the Hudson River. It's remarkable how close the Champlain and Hudson Valleys actually are to each other. Apparently, the Indians and early settlers were able to make this portage quite easily.